As a tournament admin, you can allow a range of permissions to other users. How do I set tournament permissions? Once your tournament is approved, you will be able to access the Admin Permissions tab on your tournament's admin page. 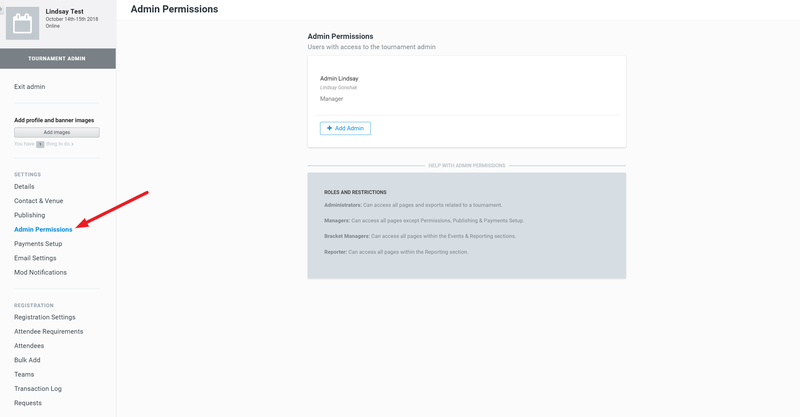 Administrator - Full access to admin permissions which are settings, payments, bracketing, and admin management [can edit and remove other admins]. This is also the only permission level that has access to attendee exports! Manager - Can add attendees, manage brackets, and report. No access to payments, publishing, or permissions. Bracket Managers - Can report as well as modify phases, seeding, brackets, waves, and stations. They cannot add attendees and do not have access to Permissions, Publishing, or Payments. Reporters - Only has access to brackets, match dashboard, and printing. They do not have access to Permissions, Publishing, or Payments.